“I don’t know about you, but I think desserts are just so much more fun when they are served miniature sized. 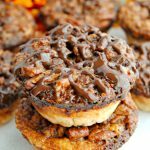 Not only are these mini pecan pies extremely easy to make, but they’re also a great dessert that people can just grab and enjoy. Preheat oven to 350F. In a medium bowl whisk together eggs, brown sugar, corn syrup, melted butter, cinnamon, pure vanilla extract and salt until blended. 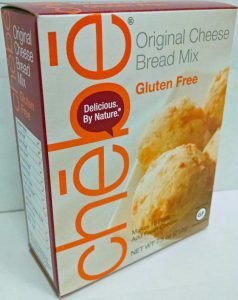 In a large bowl combine Chebe mix, sugar, eggs, oil and water. Stir with a large spoon to combine. Once the dough ingredients are combined, using a grater, grate the 1/2 stick of frozen butter into the dough. Use your hands to lightly knead the mixture into a ball. Spray a (12 cup) muffin pan with cooking spray. 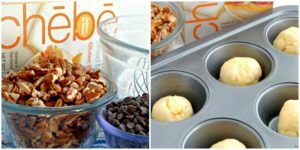 Pull a piece from the dough ball and roll into a 2-inch ball (size of golf ball) and place in the muffin pan. Repeat, filling each muffin cup. 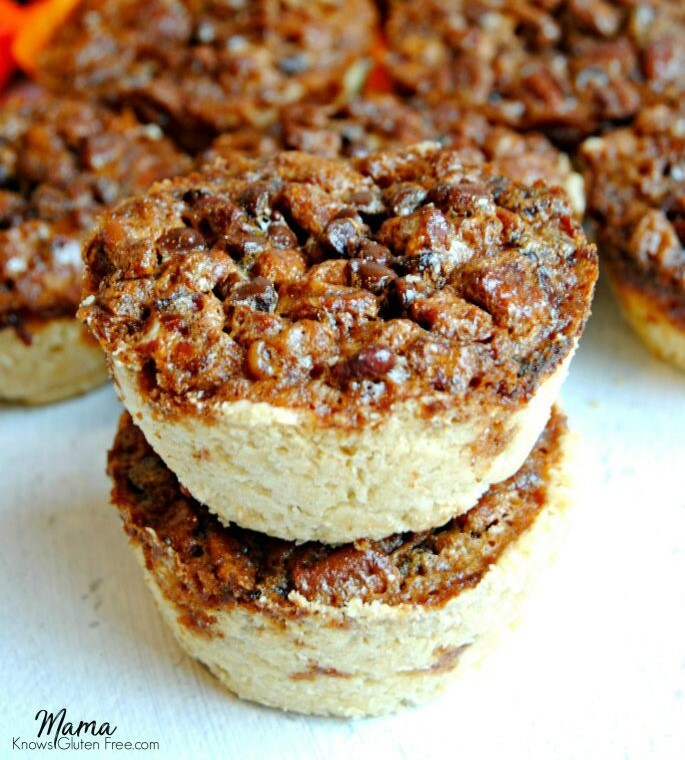 Press the dough balls down into the muffin cups and up the sides to make a mini pie crust. 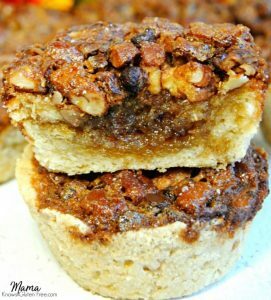 Add 1 heaping teaspoon full of chopped pecans into each muffin cup. Sprinkle the pecans with mini chocolate chips (optional). 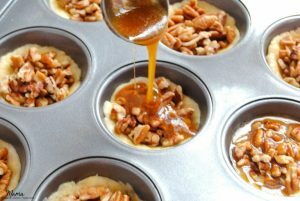 Pour 2 tablespoons of filling mixture over the pecans. Bake for 30 minutes. Remove and cool. (Take a knife and gently cut around the edges to help remove the pies easily.) Now enjoy!